Last September's 6-max ring winner Sean Yu (above) jumped to about 80,000 after 6 levels of play in today's Day 1A of the $500,000 #TVWSOPCircuit Main Event. He slid back to under 25,000 after dinner break, but turned the final three levels in to a serious heater, bagging 158,000. 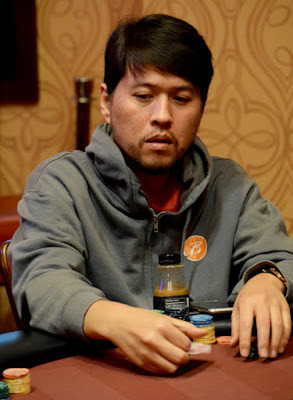 Ben Keeline (184,500) and Event x winner Michael Scott (219,000) also built big stacks, yet it was Soumitra Nagar at 246,000 who tops the leaderboard after 15 levels of play. Among the players who came for Day 1A but did not find a bag was Rep Porter, Lee Markholt, Allen Kessler, Dan O'Brien, Dann Turner, Erick Lindgren, Bob Mather, Joe Nguyen, Hafiz Khan, Casey McCarrell, Ron Brown and Brett Murray. Day 1B starts Saturday at Noon, with registration closing at 10pm when Level 13 begins. Here's all the 36 players - from a starting field of 207 - who bagged a Day2Stack.